Roseau, Dominica – July 15, 2009……. Prime Minister, Hon. Roosevelt Skerrit will take the public dialogue on the OECS Economic Union to the Dominica Association of Teachers (DAT) on Friday, July 17, 2009. The event will take place at the Convent High School auditorium, beginning at 10am. Since the launching of the public dialogue on the OECS Economic Union in Dominica in April 2008, a number of sensitisation sessions have been held with groups and organisations in furtherance of the Economic Union dialogue. These groups included youth organisations, teachers, farmers, local government bodies, credit unions among others. A number of materials and literature have been made available at these sensitisation sessions to enhance public understanding of the economic union dialogue. These include copies of the draft treaty on Economic Union, a document entitled ‘frequently asked questions’, and the address by Prime Minister Hon. 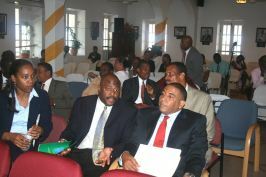 Roosevelt Skerrit at the launch of the public dialogue in Dominica in April, 2008. The Government Information Service (GIS) has also been screening on its channel over the last twelve months, the DVD , ‘Bridges to Unity’. The debate of the Economic Union in Dominica reached a higher level last week when the Governor of the Eastern Caribbean Central Bank and Head of the Economic Union Task Force, Sir. K. Dwight Venner, held a press conference with the Dominican media to brief them on progress made thus far on the public dialogue on the OECS Economic Union. Prime Minister, Hon. Roosevelt Skerrit, Prime Minister of Saint Vincent and the Grenadines, Dr the Hon. Ralph Gonsalves, Chief Minister and Minister of Finance of Montserrat and Chairman of the OECS Authority, Dr the Hon Lowell Lewis and Sir Dwight Venner held a live radio show on DBS last Thursday, a programme which focussed heavily on Economic Union issues. Plans are also well advanced for public dialogue on the OECS Economic Union with the Nurses and the Commonwealth of Dominica Police Force.